LED Landscape Lighting is the way of the future– incandescent bulbs have been discontinued, and homeowners are finding it a challenge to keep their existing landscape lighting systems operating to their best. 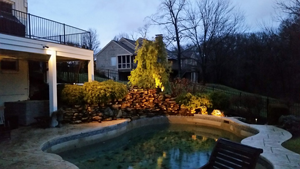 Fortunately, LED landscape lighting is actually much better than previous options. Since the bulbs don’t create heat, the system is very efficient. Converting your landscape lighting will reduce your energy cost by 75%. Additionally, you’ll save time on maintenance. Incandescent bulbs burn out more frequently. Depending on your fixture choices, each light will last between three to 20 years. Remove the existing system and start with a brand new installation. If your lighting system is over 15 years old, this is probably the best approach. An older system will have reached the end of its life, and your landscaping likely has different lighting needs now. If your system is only three or four years old, you may just want to remove the incandescent lamps and install LED bulbs. Replacing incandescents with LED retrofit bulbs is a simple process. Retrofit bulbs will have LED diodes. Their packaging gives the equivalent watts to an incandescent bulb, so you can match the intensity of lighting. Each bulb will last from three to five years. You may also replace individual fixtures with integrated LED fixtures. Some aluminum incandescent fixtures have deteriorated over time and need replacement anyway. Integrated LED fixtures don’t have interchangeable bulbs, but the entire lamp comes with a 15-year warranty. These are higher-quality to withstand the elements, and offer the benefit of never needing to replace a bulb over the 15-20 year life of the fixture. 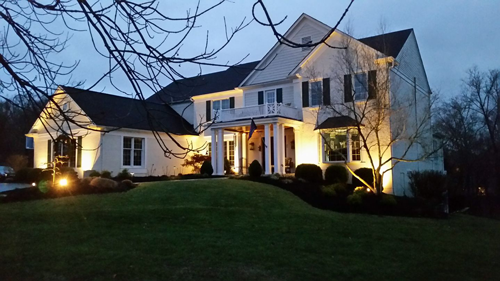 To learn more about converting landscape lighting to LED, give us a call!